This time, I would like to compare two high-end headphones with the active noise-canceling feature. The first model is the Momentum 2.0 from Sennheiser. This is the second edition of the Momentum series. In the opposite corner, there is an undisputed leader in noise cancellation – QuietComfort 35 from Bose. Both models are quite similar when it comes to features, but what’s important is the quality of these features. 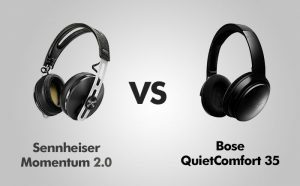 Let’s check the differences in sound quality, noise-canceling algorithms, build quality and how good are they in keeping the connection. After this review, you will be able to make a decision which pair of headphones is better for you. The Sennheiser Momentum headphones present a different approach to the design and used materials than QC 35. They cost about 500$. For that price, we should expect a very high quality in every category. When you first try Sennheiser headphones, you will notice that they are one of the most stylish headphones on the market. They don’t only look expensive, but also feel expensive. Every part of them is made of high-quality materials – from black leather pads with the yellow stitching to hinges that are made of brushed stainless steel. Even logo changes colors depending on the angle from which you look at them. They come in two color versions, which are black and ivory. Especially the ivory version is a head turner. It gives the headphones this unique look. In this model, Sennheiser stays away from the excessive use of plastic. If you want to check their cheaper (but still high quality) plastic headphones, check out my review where I compared two Sennheiser open-backed models – Sennheiser 558 and 598. They use the standard 3.5 mm port to connect to a device (while not in the wireless mode). The other end goes to the headphones. The cable must be inserted into a headphone until you hear a “click”, then twist it clockwise to lock the cable in place. In addition to being wireless, you can connect them to a smartphone with a detachable 1.4 m cable with a built-in microphone and phone controls for both Apple and Android phones. Buttons are located on the right side of the headphones. You have the power/pairing and the volume and media control buttons. Pushing the volume button two consecutive times skips the song forward and pressing three times plays to the previous song. This works both on Apple and Android devices. The QC 35 definitely loses when it comes to design. And we really shouldn’t blame them for it – they cost 150$ less than Momentum. The Bose headphones are almost entirely made of plastic. It’s high quality, but it definitely looks like a product of lower quality than Sennheiser. It comes in two color options – black and silver. The silver version looks much better. They’re classy and stylish and I think it’s a nice change over the more popular black headphones. Next to the buttons, there are volume lights indicating the Bluetooth connectivity and power levels. Because of stainless steel, you can be sure that the clicking mechanism stays firm enough without accidental adjustments while wearing. There are no strange noises like creaking and squeaking when performing a stress test. The plastic has its advantages of being light. And indeed it weighs less than SM 2.0 – 25 grams less to be exact. QC 35 are ridiculously light compared to the competition. QC 35 comes with a 1.2 m, 3.5 mm headphone cable with no locking mechanism we have in SM 2.0. Despite being made of plastic these headphones are sturdy and not easy to break. They are reinforced with metal in the hinges, so they can easily survive my stress testing. I’m sure that with a good care they can last for many years. Both SM 2.0 and QC 35 have the ability to fold in the ear cups for increased portability and can be stored inside the included cases. Perhaps the biggest complaint of the original momentum was that their ear cups were too small to actually cover the average-sized ears. For that reason, wearing them for more than 15 minutes was very uncomfortable. That was a shame because they were great headphones in almost every other aspect. With the new Momentum 2.0 Sennheiser completely resolved this issue and now they are comfortable like any other pair of high-quality headphones. The earcups have a bigger diameter, making them real over-ear headphones. What makes these headphones more comfortable are not only bigger ear cups, but also softer foams than that in the original SM. The ear cups slightly rotate to perfect fit making them even more comfortable. The earpads are very plush and seem even more comfortable than before. The only problem I had is that they become warm after using them for over 30 minutes in a warm room. But it’s nothing out of ordinary at it also happens with other headphones. The next cool feature that is not often found in headphones, are metal rails where you can slide ear cups up and down instead of using a traditional headband with an extendable arm and the clicking mechanism. With this rail solution, there is enough tension to keep the earcups in place. When headphones are called QuietComfort, you expect them to be comfortable. And they are. They are one of the lightest Bluetooth pair of headphones on the market, only slightly heavier than wired QC 25. They are very flexible. Even my stress testing didn’t do them any harm. There is a super soft foam on the top band and the leather ear cushions. This combined together makes them really great to wear. They don’t give you any fatigue at the crown, and there is no discomfort even after wearing them for several hours straight. Sennheiser is known for making high-quality headphones, and with this model, they try to bridge the gap between audiophile sound quality and practicality. It’s no surprise that the sound is great. They do a very good job, maintaining great quality throughout the whole frequency spectrum. The bass is tight and punchy without being overpowering, treble is crisp and mids don’t lack anything. The soundstage of these model is especially wide for closed-backed headphones, the vocals and instruments don’t collide with each other. You can clearly notice the direction from which the sound is coming from. The sound quality in QC 35 is almost exactly the same as in wired QC 25. The sound is good, but nothing spectacular. If these headphones are your first high-quality model, it will be a nice, but not a mind-blowing experience. The soundstage is good – the vocals and instruments seem to be spaced out nicely and they feel more natural, and not in-your-face, compared to other closed-back models. Closed-backed design headphones usually have a punchier bass, and it seems noticeable in QC 35. The midrange seems to be a bit muffled. Both of these headphones have a low impedance rating. This means you don’t have to use an amp to have plenty of volume from a standard smartphone. Noise canceling in Momentum does the job – it blocks most of the undesirable outside sounds, but it can still pick some sounds like conversations. When you put on Bose QC 35, you will know why Bose is known to be the king of noise cancellation. Their algorithms responsible for reducing noises from the outside world are superior to other companies. When you put on the QC 35 headphones, it silences the entire world. It’s just a whole different level. If you used the Bose noise-canceling headphones before, you know exactly what I’m talking about. 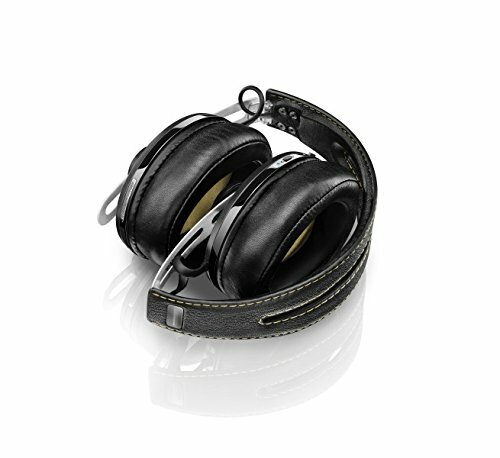 They are perfect for flights or other loud environments such as buses or trains. SM and QC 35 are closed-backed headphones. This means that they isolate the outside noise and keep music from leaking out. 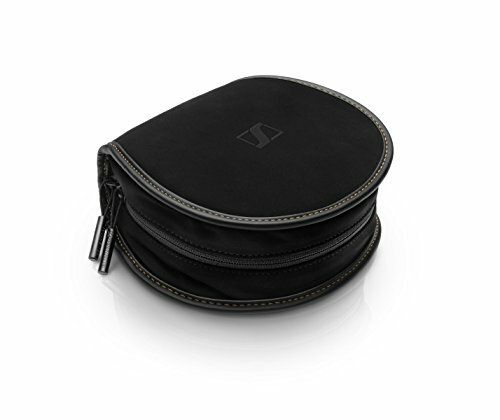 If you want to compare them to the open-backed headphones read the Sennheiser open-backed review. For those who want to use these headphones wirelessly, I have to say that the Sennheiser Momentum 2.0 doesn’t lose signal easily – there were no interruptions, even when I placed a smartphone in a different room. Additionally, they have NFC (Near field communication), which is very useful for Android users. If you have a phone with this feature, just tap the side of the left ear cup and the pairing is basically instant. The Bluetooth feature is the biggest selling point versus the older QC 25. The headphones also have the NFC feature, so they can pair with a device flawlessly. Put them next to your Android phone and the pairing is automatic. In both of these headphones, the battery is a huge selling point. The headphones can play for at least 20 hours (with the wireless mode and noise canceling on). Sometimes, the battery can last as much as 25 hours. You can use the micro-USB cable to charge and listen to music. When you connect SM 2.0 to a computer, you have to set your headphones as the default speaker and then listen to your music through the micro-USB cord. 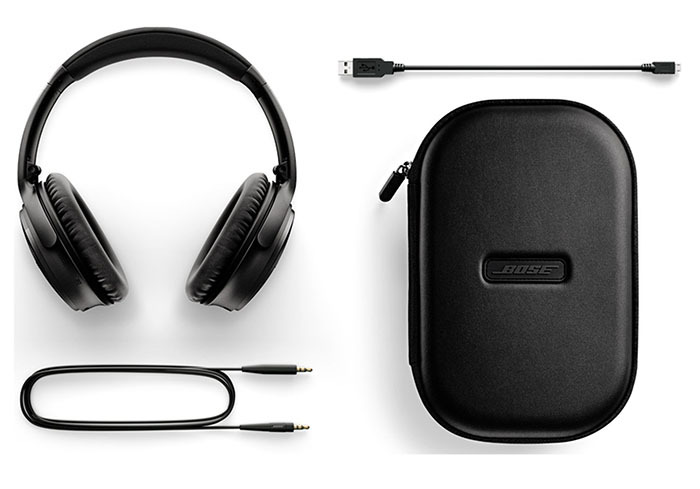 The Bose claims 20 hours in the wireless mode and 40 hours with the cable and the noise-canceling feature on. From my test, it seems that they can last even more than 20 hours. The charging process lasts for about 2.5 hours from dead to full battery. If you turn on the QC 35, it will tell you what percentage of the battery remains. Similarly to SM 2.0, the QC 35 is charged via the micro-USB port. SM 2.0 comes with a few accessories. With QC 35 you will find the following accessories. CONS: Price. CONS: Bass could be better.